Open year round; military & extended stay discounts.. This wonderful B&B hotel has hosted guests for 32 years. The current innkeeper is the third host and has just (2107) completed renovations to enhance the guest experience: new beds, TVs, sound insulation, lighting, carpets and more. 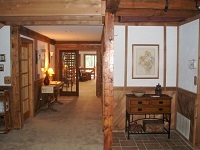 A true post & beam cedar lodge with the unique warmth and charm of a comfortable ''mountain retreat'' hotel. Cozy rooms, hearty breakfasts, attentive hospitality and 14 wooded acres of natural beauty. Extensive decks, shade porches and patios provide the perfect opportunity to sit and enjoy the hilltop surroundings. Walkers can enjoy the 1/2 mile paved private drive meandering through the woodland preserve leading to the neighbor's horse farm. Total privacy!. Our hearty breakfasts are served on antique Fiestaware, at 9AM. Individual couples seating is the norm with some small group seating tables available. We have seasonal (Nov. through Apr.) 360 degree panoramic views, sunrises and sunsets that light up the sky. During the shady summer and the colorful fall months, we invite you to enjoy the tranquility and privacy of our woodland preserve. We're only six minutes from downtown Dahlonega, and convenient to restaurants, wedding venues, hiking and most attractions & venues. We have great mobile phone service on our property. You don't have to go outside or search for a cell. Route 52 and 9 West; turn right on Siloam Church Road; turn right on Old Elijay Rd E.; turn left onto MTL Road; follow drive 0.5 miles to top of hill to lodge.